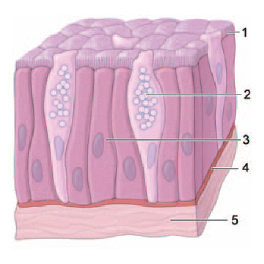 Three factors contribute to skin color: 1) the amount and kind (yellow, reddish brown, or black) of melanin in the epidermis; 2) the amount of carotene (yellow) in the epidermis and subcutaneous tissue; and 3) the amount of oxygen bound to hemoglobin (red blood cell pigment) in the dermal blood cells. Skin color is genetically determined, for the most part. Differences in skin color result not from the number of melanocytes an individual has, but rather from the amount of melanin produced by the melanocytes and the size and distribution of the pigment granules. Although darker-skinned people have slightly more melanocytes than those who are light-skinned, the distribution of melanin in the higher levels of the epidermis contributes to their skin color.